Is it summer and you have that ringing in your ears? You know the one I mean - it sounds like "I'm bored!" ringing out in high pitched tones. Give the munchkins something fun to make by working on this simple project. The friendly lizard can be made into key chains, ornaments, zipper pulls or anything a creative mind can come up with. The kids will love it. Here's how. Gather your supplies. The age of the child you are working with should determine the materials you use. For example, an older child can handle smaller holed beads, therefore if you have some from old projects, you will be able to use those. A younger child will need something with a larger hole, pony beads work wonderful. The same goes for the stringing material. An older child may appreciate working with the colored wire, as it will allow their lizard to actually stand, the wire giving it more mobility. A younger child, however, will need something easier and therefore less liable to frustrate them - use yarn or string for this lizard.Cut your stringing material, whether wire/yarn or string to a length of about 3 feet (1 yard). 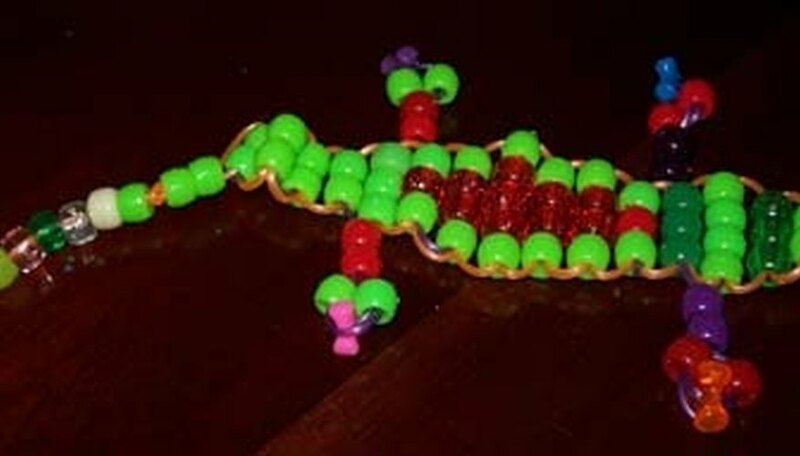 This can be less if a child is working with small beads as the lizard will be smaller. The stringing material must be able to pass through the beads twice, so be sure your bead holes are the appropriate size. Make the lizard's head. 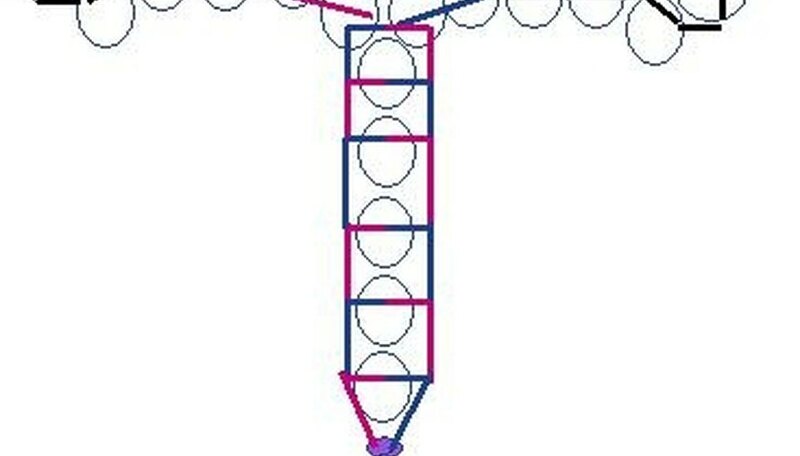 In all the diagrams following, I have color-coded each side of the stringing material to make it easier to follow.Place 1 bead at the halfway point on your stringing material. (This is the nose). Next, place 2 beads on the string, passing each side of the string through the bead so it comes out the other end. This means you will have 2 pieces of string/wire/yarn inside the bead. Next, take 1 different colored bead, 1 bead, and 1 bead same color as the first on this row and place on string (This will give you 2 eyes that are the same color). Again, remember to pass both ends of the stringing material through the beads and pull tight gently.Next, place 2 beads that are the same color as the rest of the "head" and pass both ends of the stringing material through them. Make the Front Legs.On each side - string 6 beads. Taking the end of the string, count back 3 beads and pass the string/wire/yarn through the last 3 beads. 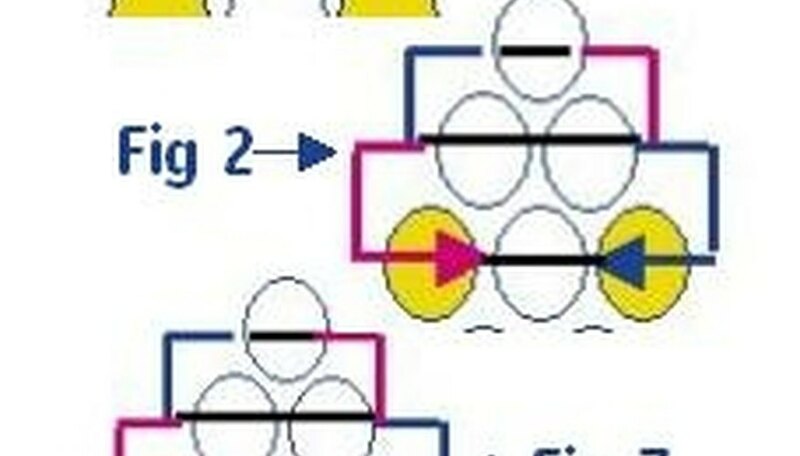 If done correctly, you will have 2 strings going through the last 3 beads and 1 string going through the "foot"String 2 beads and pass each string end through to the opposite side. These 2 beads are the beginning of the body. Make the Body.After you have passed the string through the 2 beads (last instruction above) string 3 beads, passing the wire/yarn/string through. The next row, string 4, then string 4, then another 3 and then 2. This will end the "body" and allow you to immediately begin the back legs.The body can be done in any pattern or with multiple colored beads. 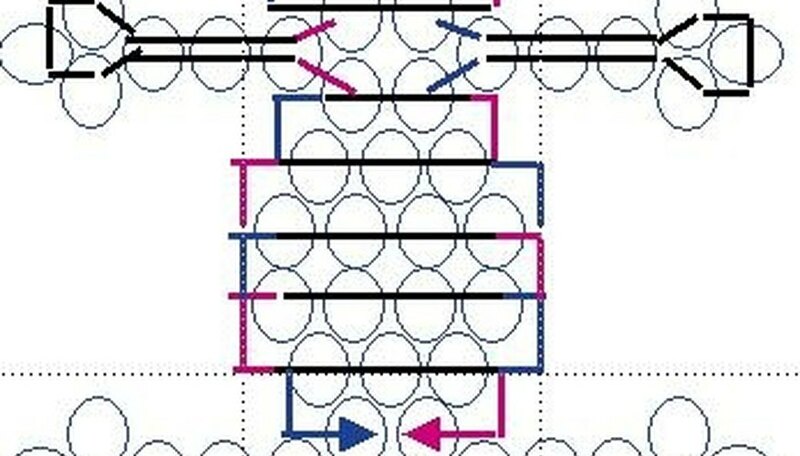 Watch the diagram and note the diamond pattern possibilities. Make the Back Legs and Tail.The back legs are created the same way the front legs were done. (See Step 3).Once you have placed the last 2 beads of the body, you will need to string 5 beads, one at a time, for the tail. As you string each bead, pass the ends of your wire/yarn/string through from each side, causing a wrapping effect on the bead.After you have strung the final bead, take both ends and pass them through 1 final bead (must be smaller than beads used in body to "plug" the hole. )If using yarn or string, tie 2-3 knots and trim excess from tail.If using wire, wrap the wire tightly around a toothpick. Gently push the wrapped wire off the pick to achieve a "curly" tail look. To make into a key chain or ornament, place a jump ring through the nose of the lizard and tighten.